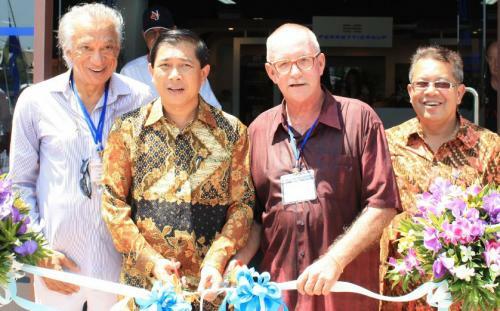 PHUKET: The 10th Anniversary Phuket International Boat Show (PIMEX) opened today to a large gathering of island dignitaries, VIPs, exhibitors, visitors and media. While the traditional boating markets of Europe and the USA continue to struggle in the current economic climate, Phuket is driving Asia’s growth and continues to attract top international boat brands and marine products to exhibit. Pivotal to Asia’s marine industry, Phuket is the region’s yachting playground and has often been referred to as the ‘Monaco of the East’. The island’s well developed marine infrastructure and surrounding cruising grounds make it the destination of choice to berth, maintain and enjoy a marine leisure lifestyle. The marine industry in Thailand continues strong, with 15% year-on-year growth in marine leisure and related tourism. PIMEX remains the key marketing platform for businesses in the region to market to international visitors from as far afield as Russia, Australia, China and beyond, and helps to generate over 7 billion baht a year for the industry. “PIMEX celebrates it’s 10th Anniversary this year, and over the years we have been proud of the role the show has played in helping to develop and promote Phuket and Asia’s marine industry,” commented Andy Dowden, the show’s director. This year’s exhibition showcases the best of marine and lifestyle in the region, with a packed indoor exhibition hall and in-water displays expecting to attract over 4,000 visitors and interested buyers. Boats on display range from Blosson Uno, an Astonda 102GLX being shown by Princess Yachts, the show’s largest exhibitor, to trailer boats, with every model, size and type in between. All the major boat brands from around the world are on display. PIMEX is, however, more than boats. The show includes a wide offering of marine products and services, engines, hardware, widgets, gadgets and marine toys, together with charter operators, boat builders, marinas and luxury properties. “There is something for everyone. The in-water displays make up one of the best yet. All in all, we’re offering four days of entertainment, making for a great family outing,” said Dowden. The Phuket International Boat Show is open from today through Sunday, from 11:00am to 7:00pm, with the exception of Sunday when closing time is 6:00pm. Entry is free. The show is sponsored by the Phuket Gazette, PGTV, and the Gazette‘s weekly ‘Phuket Today’ show, broadcast eight times a week on True Visions to 1.9 million subscribers nationwide.